The summer season is approaching and owning an outdoor swimming Pool is an important part of the family’s lifestyle. A swimming pool means not only cooling off on a hot day and a lot of summer fun, but it's also a great way to exercise and relax. However, the water to be used in swimming pools needs to be maintained at a comfortable temperature. If you are also planning early morning or romantic late night swims, a swimming pool heater is undoubtedly needed. And also, with pool heaters you can extend the swimming season by weeks or even months. 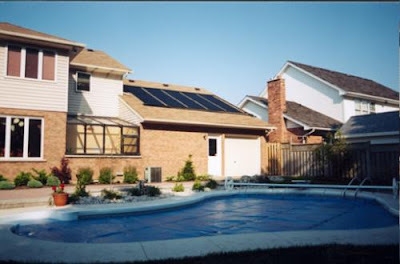 If you are concerned about the environmental impact and big expense of heating pool water you may want to consider solar heating for your pool. Solar pool heating is a great way to reduce your energy bills, protect the environment and extend your swimming season. A solar pool heater can work in conjunction with a natural gas or electric pool heater as back-up on cool or cloudy days. Pool water is pumped through the filter and then through the solar collectors, where it is heated before it is returned to the pool. In hot climates, the collectors can also be used to cool the pool water during peak summer months by circulating the water through the collectors at night, when air temperatures are lower. It typically costs between $2,000 and $4,000 to install a solar heater for an outdoor swimming pool (cost of pool heaters can vary based on the size of your pool). The advantage of a solar pool heating system is obvious - the energy of the sun is free, the price of installation is a onetime fee, payback can be as low as 2 years, very low operating and maintenance costs, and 15-25 year lifespan (depending on the panel and manufacturer). In one of my next posts, I’ll write about different collector types of solar pool heaters and factors determining the size of the collectors.